Introduce a stylish accent into your bedroom with this upholstered storage bench. Dark Chocolate bicast leather on the seat provides comfort and enhances the warm tones of the Brown Oak finish. One shelf offers open storage for items like books or blankets, while the hinged seat opens to reveal storage space for small items you'd like to tuck away out of sight. 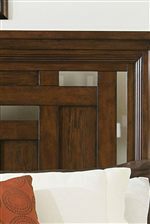 Complete the relaxed look of your bedroom and add convenient storage with the Estes Park upholstered storage bench. The Estes Park Upholstered Seat Storage Bench with Shelf by Broyhill Furniture at AHFA in the area. Product availability may vary. Contact us for the most current availability on this product. 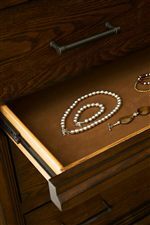 Paint & Finish Options Collection is available in a dark artisan Brown Oak finish. 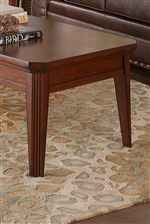 The Estes Park collection is a great option if you are looking for furniture in the area.